Eurodollar has two meanings, it can be a global currency common to the USA and Europe, and it can also be a name for US dollars located outside the USA. We have seen in the past that a collapse of a currency leads to a major regional or even worldwide economic recession. Collapses in many East Asian countries, Russia, and the USA are the proof of it. The concept of the Eurodollar is one simple solution to the problems which currencies are causing the international economy. One option is that the euro could be merged with the dollar to create so-called Eurodollar. 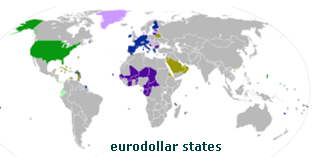 The Eurodollar would act as a single currency for both the United States and Europe. The Eurodollar could possibly act as a single common currency for the rest of the world. As we said, the term Eurodollar has two meanings. The Eurodollar can be, as explained earlier, a single currency used across the United States and the Eurozone. In addition to the idea of one global currency, the term Eurodollar also relates to the USD currency located on bank accounts outside of the United States. Many foreign banks in Europe accept deposits of U.S. dollars. U.S. dollars are deposited on USD denominated accounts in Europe. These dollars are often called Eurodollars. The Eurodollar market is today the capital market of the world. The Eurodollar capital market includes Eurodollar financial accounts of U.S. corporations funding foreign operations. The Eurodollar market encompasses also accounts of foreign corporations funding their foreign or domestic transactions denominated in US dollars. And lastly, Eurodollars are also placed on foreign governments accounts funding investment projects or balance-of-payment deficits. Because Eurodollars are not under the jurisdiction of the Federal Reserve, Eurodollars are subject to less regulation than similar deposits within the USA which allows foreign banks to have higher margins on Eurodollars. The introduction of a single currency for the United States and Europe, the Eurodollar, would produce both economic benefits and economic costs, but the net economic benefits should on average exceed the costs. First, Eurodollar, a single currency increases the transparency of prices. Second, having a single currency, using the Eurodollar, makes economic transactions easier than having different currencies for the union. Third, Eurodollar reduces the transaction costs of buying and selling goods because people do not have to convert money from one currency to another. Fourth, Eurodollar would eliminate exchange rate risk among the countries that shared the Eurodollar currency. Fifth, using Eurodollar, USA and Europe could no longer use devaluations as part of their economic policy to gain an advantage one over the other. Sixth, because the Central Bank which would oversee the Eurodollar union would not be controlled by a single government, it would be easier for the Central Bank to focus on its primary objective-to control prices and fight inflation. Seventh, Eurodollar would encourage international trade and reduce the disruptions that result from currency fluctuations. First, labor must be mobile. People should be able to move from an area suffering from recession to one that is enjoying an economic boom. Second, Eurodollar needs that wages and prices must be flexible. Third, there must be some way of transferring resources to the country or region which is in dire economic straits in order to help it recover from its recession. Fifth, countries must be politically willing to adopt the Eurodollar common currency. Eurodollar timetable. The earliest date which the euro and the dollar could be linked together at a 1:1 ratio would be January 1, 2015. Basic fact: The Eurodollar will act as a single currency for both the United States and Europe and improve the stability and efficiency of the global economy.